Today I’m writing a blog post about a heavy and uncomfortable topic that is often avoided. As a Single Woman, you long for connection, and sometimes that desire affects you so much that you settle for a relationship that is unhealthy. You get involved in a toxic relationship. In the beginning, it might all seem fine and even appear normal. But after a while the signs become obvious and you wonder how it happened. 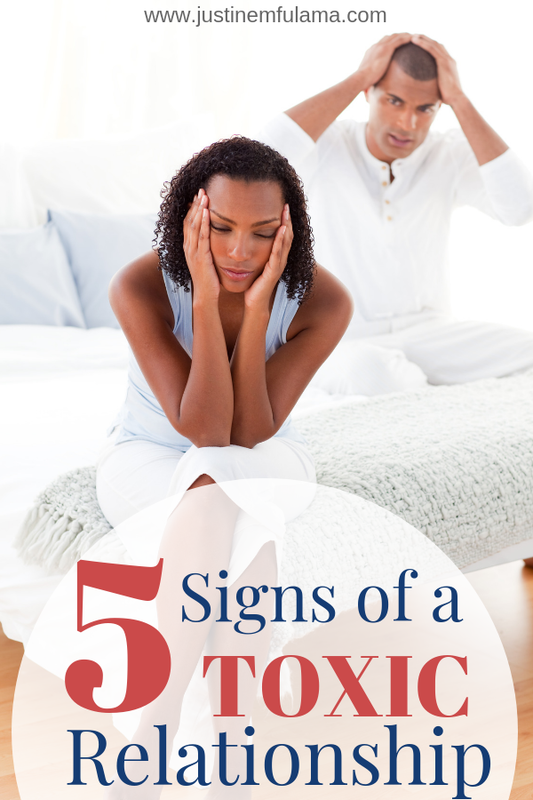 Today I’m sharing with you 5 Signs of a Toxic Relationship why it is dangerous. In order to understand what a toxic relationship is and how to identify one, I first want to share with you the different signs of a toxic relationship. If you have been or currently are seeing a man that is inconsistent than this one is for you. I believe that if a guy is ghosting you (the term for someone that is inconsistent in his communication) it ultimately means that this man is not treating you with the value you truly deserve. As women, we tend to give men that are inconsistent the benefit of the doubt in the beginning. We are mindful that he might be busy with work, going through challenges or simply avoiding drama. While all these things can play a role in his life, you also need to understand that these challenges will pop up over and over again. If his first reaction is to drop all his responsibilities towards you then this is a red flag. It also means that he is clearly not treating you as a priority but an option. Which can easily turn into the type of option that he only uses when he is desperate. Do any of you ladies have kids around? Maybe your younger siblings, nieces, and nephews or own kids? Well, one thing that always works as a punishment for kids is giving them the silent treatment. The act of denying them attention or even worse, love, is one of the most heartbreaking things to do to them. And while you might think it only works with children, you are mistaken. The silent treatment is a passive-aggressive form of emotional abuse, in which you are punished for doing something wrong. In toxic relationships, one person will often use this form of abuse to induce feelings of powerlessness and shame by stripping you off your psychological need for belonging and self-esteem. Personally, I consider this one of the worse forms of abuse and pray that you are very cautious with the people you allow into your lives. Because the tendency to use silent treatment as emotional abuse can be seen very early in a relationship and should not be ignored. Disclaimer: The silent treatment is a form of emotional abuse that is very often used by women! So, if you are reading this, I ask you to analyze your own behavior. Do you tend to make a face and say ‘nothing’ when you are mad at your boyfriend? If you are, I want to let you know that that is NOT cute or a good way to solve a conflict. In a healthy relationship, you are able to voice what is wrong and communicate your needs to the other. Remember that the next time you use the silent treatment. One thing I have learned over the years is that the friends of mine that always needed to make fun of me in order to be funny, where those that didn’t mean well. While sarcasm can be very funny, it can also be very painful. That’s why if a guy is repeatedly overly sarcastic and criticizes and teases you but masks it as a joke, you need to be cautious. It’s an indication that he is testing the waters to see how much negative talk you will accept. 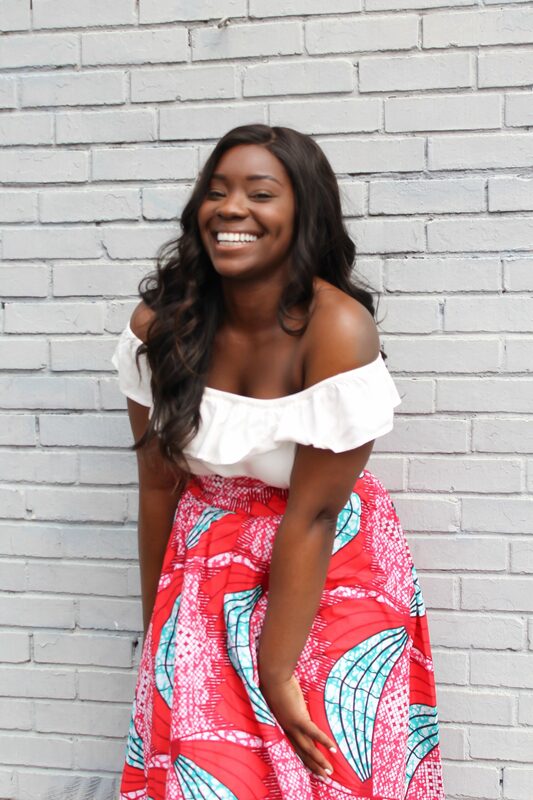 And if you just laugh it off, without ever speaking your mind, you train him that you are okay with it. Which can become a problem in the future. You don’t want your man to low-key disrespect you as long as he masks it as a joke. That is neither nice nor funny. If he says something that you don’t like, let him know and encourage him to speak things to you that are uplifting. Or show him a way to voice criticism that will build you up rather than make you feel stupid. Remember, that sarcasm is often used as a passive-aggressive way to communicate in relationships. And passive-aggressiveness can turn into aggressiveness reeeeeal quick and turn your relationship toxic. Manipulation, I believe is one of the more obvious signs of a toxic relationship. Some examples include someone that constantly blames you for things that go wrong. Someone that constantly shames you for being who you are. The goal of manipulations is to break your spirit by making you doubt or dislike yourself and your behavior. You are made to believe that something is wrong with you or that you are not (good) enough for him. The only thing I have to say to this is: THE DEVIL IS A LIAR! Because you are wonderfully and fearfully made and the king of kings himself designed and created you. Men who are manipulative, oftentimes try to validate their own insecurities by magnifying yours, so that they can feel better about themselves. So, if the guy you are dating has a hard time owning his mistakes and deflects them to you, be aware he might try to manipulate you. Verbal abuse is the art of directing negative statements toward someone, causing emotional harm. Verbal abuse consists of behaviors that are non-physical, but which can still be rather damaging, such as being threatening, insulting, or humiliating toward someone. Physical abuse is any action resulting in a non-accidental physical injury, including not only intentional assault but also the results of unreasonable punishment. The list of abuses goes on and on, but these two are the most common in toxic relationships. Here one partner will use these types of abuse to dominate or control their partner. This is why it’s important to recognize the signs of a toxic relationship early on so that you are mentally strong enough to leave. Don’t wait until emotional and physical abuse becomes a normal part of your relationship. Now that we are aware of the different signs of a toxic relationship, let’s look at the 10 reasons why a toxic relationship is dangerous. With regards to all the things mentioned above, it’s important to understand that toxic relationships start harmlessly. Occasional sarcastic jokes, silent treatment when he’s mad or manipulating you to feel bad about your ‘high’ standards. Problem is, it doesn’t stop there. One thing leads to another and after a while, it becomes the norm in your relationship. Both of you develop a routine that includes playing specific roles. One is the abuser and the other one the peacemaker. You get used to continuously having to make it up to him and apologize for a minor argument. That makes you develop a fear of abandonment and increases insecurity. 1 Corinthians 13:4 tells you that love is patient, love is kind… Let me just stop right here. Love is patient, love is kind point blank exclamation mark. I’ve mentioned it already, but it’s worth repeating just because relationships and even marriages are “hard” doesn’t’ mean that they are not loving. Healthy relationships are a lot of work because both partners decide to put the commitment, sacrifice, and effort in that it takes to make it work. However, they do it because they love each other. Someone that displays toxic relationship patterns does not know what love means in its purest and godliest form. And might need to be taught, reminded or coached to change their thinking. Don’t make the mistake to confuse abuse with love, because they say so. Instead, search the bible for its definition and study how Jesus displayed love towards us. You will quickly learn that he never hurt anyone in the name of love. The beautiful thing about being a Christian is that we know God can change people. We have seen it happen to others and experienced it ourselves. So, it’s easy to get caught up in the hope that your partner will eventually change. And yes, I agree with you, by God’s grace he will. But you are not God. Don’t stay in a toxic relationship hoping that you can change him. Trust God, remove yourself from the situation and let God do what he does best. Save! Honestly, I don’t even know how to say that. And while I’m aware of the criticism this could attract, I know how important it is to voice this. Toxic relationships exist even in the Christian community. Which, I believe, is not even the problem. Because at the end of the day NOBODY is perfect. Christian or not. As Christians, we are very aware of it and that’s why every day we seek to become more like Christ. But what is a major problem is that a lot of us think we need to stay in a toxic relationship no matter what, because God called us to it and wants us to persevere. So yes, God calls you to persevere, practice endurance, and be patient in different areas of your life. But if your boyfriend is emotionally or physically abusive and endangers your health and well-being than I doubt that it’s God’s will. Please, please, please if you feel at risk in your own relationship, then I ask you to seek wise counsel or marriage counseling. Connect with a pastor at your church who can give you Christian relationship advice. Don’t misinterpret scripture but ask someone who can teach you. This point is very simple. Depending on the form of abuse that is performed in a toxic relationship you can get hurt or worse, die. You might think that this is a little harsh and exaggerated but trust me it’s not! As mentioned before, toxic relationships usually start with small dysfunctions, turn into emotional abuse and oftentimes lead to physical violence. If you have to wonder whether or not your partner’s physical actions are a sign of ‘real’ love, then you most likely are in a toxic relationship. If you don’t have kids, then feel free to skip this point. But if you do have them, read carefully. Most signs of a toxic relationship happen behind closed doors. So, people from the outside, don’t necessarily know what’s going on. However, your kids know. No matter how small they are, they can tell that something is wrong. And depending on how long they are exposed to it, it can affect the way they grow up to show love themselves. Too often we hear about men and women repeating the unhealthy relationship patterns they have seen in their own homes. Because you can only practice something you have learned. And essentially showing love is taught in the home. Staying in a toxic relationship with kids, will not just affect your life negatively, but also theirs. This is probably the most heartbreaking (besides the ‘you could die’ point of course). I love love love LOVE. Real, unconditional love like I feel it for my little cute nephews. And I desire to experience that in the future with a husband and children of my own. The danger about remaining in a toxic relationship is that you could end up never knowing what real love is. And forever confuse it with heartbreak. How sad would that be? God created us out of love, to love and be loved. Don’t rob yourself of the one experience that will change your life forever by remaining in a situation that is blinding you. The only way to avoid falling into a toxic relationship is by evaluating the relationship from the start. Ask yourself if the relationship is mutually beneficial and fulfills both of you. If you have the feeling that every time you meet him is to satisfy his needs, then it’s most likely that he is using you and your relationship could turn toxic. Don’t think that as a woman you always have to give and give and give without your needs ever being met. It’s a lie a lot of us believe because we think that’s just what women do. But it’s not true! In a healthy relationship, both partners spiritual and emotional needs have to be met in order for them to care for each other. A good man respects and cares about you. He will desire to make you feel comfortable, even if that means abandoning social stigmas. If he doesn’t care about you being uncomfortable and only cares about fulfilling his own selfish needs than that’s an indication you are in a toxic relationship. So, if a guy is pushing your boundaries or making you feel bad because of your standards or values, then he is using guilt, shame and manipulation to get you to do something that only satisfies and serves him. That is a person and behavior you don’t want to allow in a relationship and needs to be checked early on. For more healthy relationship tips check out 10 Signs of a healthy relationship. Share what is going on with your close family and friends. Study shows that victims of physical abuse don’t share what is really going on in their relationship until it’s too late, because they are ashamed. Don’t hide, but entrust your relationship problems to people in your circle that can help and intervene. This one goes hand in hand with the first point. Once you talk to family and friends about your situation, seek help in the form of wise counsel, marriage counseling or therapy. Don’t attempt to work through it alone and potentially endanger yourself more. A woman’s identity is not found in her relationship status or whether she was able to save her relationship or not. Truth is both individuals in a relationship are responsible for their own actions. And sometimes that means you can’t do anything about your partner’s dysfunctions. So, accept the truth about them and the relationship. And remove yourself while it’s still safe to do so. Ladies, this topic is very heavy and less cheerful than my usual posts, but very important. If any of my above signs or patterns sound familiar and you are worried about your safety, you need to take action. Contact your local pastor and get authorities involved if necessary. The National Domestic Violence Hotline can be reached 24/7 at 1-800-799-7233. As women I want you to know that you deserve a man that is kind, considerate, thoughtful and loving. You hold the power to show the man you like how you want to be treated. So, if he is not treating you right, then you need to ask yourself two questions. Is this relationship what you believe is best for you? Is this relationship what God believes is best for you? Because one thing is for sure, there is no one that loves you more than God and he would never send you someone that treats you badly. 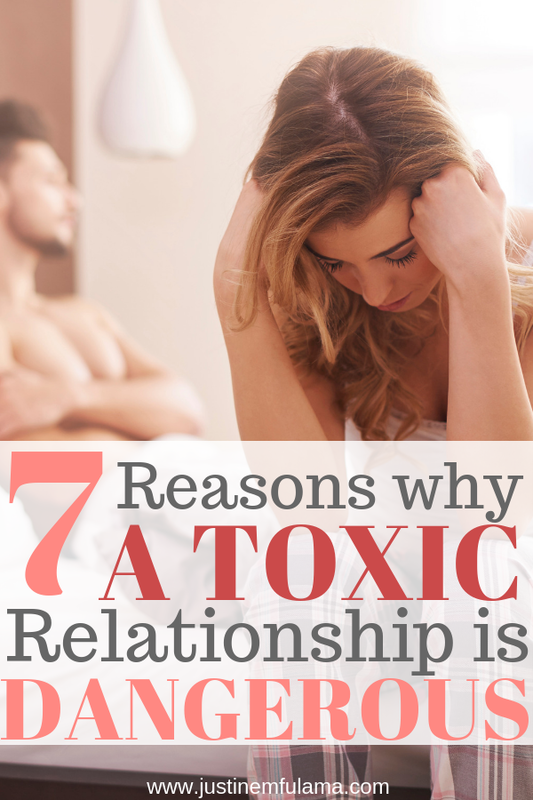 Do you know other signs of a Toxic Relationship? Share BELOW! I have read several of your posts this past week and I truly believe God directed me to them. Thank you for speaking to a difficult subject. The relationship between myself and my husband a toxic one and I am preparing to leave. We do have young children and this post in particular has reinforced to me how important it is that I consider what the negative impact of staying will have on them (not just on me). Thank you also for the hope in Jesus that you include in everything that you write. As difficult as the past several years have been for me, they have brought me so much closer to God and in that respect I feel richly blessed! I’m so sorry about what you have to go through. But I truly believe that your experiences will be used to save and minister to others one day. I pray that you stay safe in this time and that God may give you the strength and hope you need to get through it!